It is very important to become familiar with the recommended safe operational procedures before attempting to work with a chain saw. A safe way to prepare yourself for operating a chain saw is to read the operator’s manual and obtain training from someone who is experienced with chain saws. This publication was authored by George Maher, retired Ag Safety Specialist, NDSU Extension Service. A safe way to prepare yourself for operating a chain saw is to read the operator’s manual and obtain training from someone who is experienced with chain saws. It is very important to become familiar with the recommended safe operational procedures before attempting to work with a chain saw. You could learn the safety information from experience alone but that may have a very high price – mishap and injury – and probably isn’t worth it. Be sure that you are in top physical and mental condition when operating dangerous machinery. Medications, alcohol, and similar influencing factors can cause you to be a hazard to yourself and others when working with chain saws. Your chances of injury become much less when you are alert, well-rested, and healthy. Equip yourself with protective clothing and equipment (Figure 1). Safety goggles, hearing protection, steel-toed shoes, hard hat, gloves, and close-fitting clothing are all advisable when chain saw work is to be done. Chaps are available that are chain saw resistant. They are designed to protect the left side of your leg, where most chain saw injuries occur. Figure 1. Proper clothing and equipment can reduce injury. There are three sizes of chain saws to choose from based upon the type of work. Lightweight saws have an 8 to 12 inch guide bar and are best for light work, cutting small branches, and felling very small trees (6 to 10 inch diameter at the cut). Midweight saws are equipped with a 14 to 20 inch guide bar and are excellent for frequent log cutting and felling of small trees (12 to 18 inch diameter at the cut). Heavy weight chain saws have a guide bar more than 20 inches long and are for professional use, not the average consumer. So, consider the type of work you have to do and select the saw accordingly. Preventive maintenance always pays off with chain saws. Properly sharpened teeth will cut quickly, smoothly and more safely. Check the chain tension and lubrication system for proper function. A clean air filter, good sparkplug, and effective muffler will make for a better running engine, making your work easier and safer. Follow the manufacturer’s advice in the operator’s manual when making adjustments to the chain or engine. Be sure to wear gloves or cover the chain with a heavy rag when sharpening the saw teeth. The newly sharpened teeth will easily inflict injury. File or grind according to instructions for best performance. Proper chain tension helps to ensure long chain life and safer cutting. A chain that is too loose will tend to derail and whip about dangerously. On the other hand, a chain which is too tight will bind and wear prematurely. All chains stretch with use and frequently need checking and readjusting. Good lubrication helps to prolong chain life and maintain tension adjustment. Check the oil often and refill according to instructions. Be sure to use the correct bar oil. Always use both hands when starting a chain saw, one to hold the saw and the other to pull the starter rope. Some chain saws can also be held down with a foot while starting Check the owner’s manual for additional starting information. 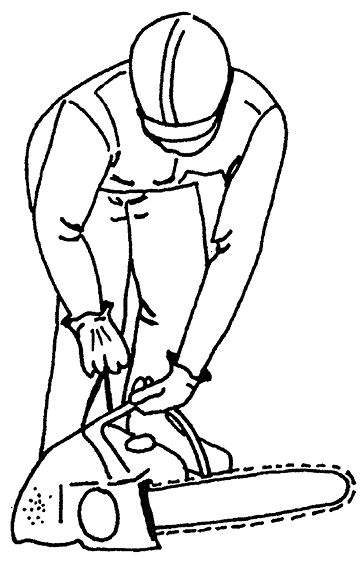 Grip the top handle of the saw firmly and pull the starter rope quickly (Figure 2). It is not a safe practice to start a chain saw while holding it in mid-air with one hand. Always start it on the ground on a stable surface. Figure 2. Start chain saw engine by setting saw on firm ground with chain out of gear and free of obstacles, placing right foot in loop of rear handle, pressing left hand down on upper handle and pulling starter rope straight up with right hand. Always use both hands to control the chain saw. Cutting a tree or limb while you have only one hand controlling the saw is very dangerous. Never force a chain saw through a cut, if it is properly sharpened and adjusted it will cut, almost by itself. Keep in mind that the hardness of the wood will have a major effect on how quickly it cuts. There are many things to do and consider before starting to fell a tree. Examine the tree; which way does it lean and how is it weighted? This has a lot to do with the direction it will fall. Is that area clear of people, power and utility lines, or anything that would be hit? Clear the area of people, vehicles, branches and debris. If an electric power line is in the vicinity of the tree, don’t attempt to work on the tree unless you are absolutely certain that it will not interfere with the electric line. If the tree must be removed and you suspect there will be a problem, call the power supplier, they have the expertise to do it safely. Will the wind have an effect on how and where the tree will fall? What about other trees? A very dangerous hazard is made when the cut tree entangles with another and does not fall completely. Determine the direction of fall carefully as well as an escape route. Don’t wait until the tree is falling to decide which way you should move to avoid being hit. Always plan an escape route to a safe location from where you are working. Your path of retreat should be along a line approximately 45 degrees from the direction of fall of the tree (Figure 3). This is most important when cutting (felling) trees. Select a place to set the chain saw; it is never recommended to run with a chain saw in your hand, operating or not. Turn off the chain saw and set it down; it is replaceable – you are not. Figure 3. Plan a safe, unobstructed path of retreat before making felling cut. 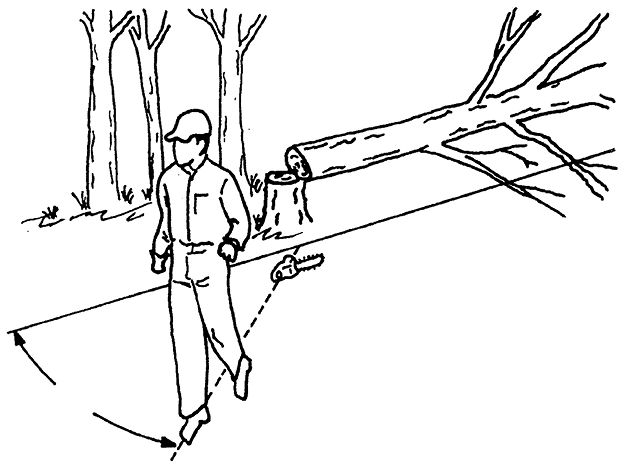 When tree begins to fall, remove safe, stop motor, set it on ground and retreat rapidly at 45-degree angle from line of fall. Plan the cuts carefully. Smaller trees (up to a 6 inch diameter) may be cut clear through with one pass. 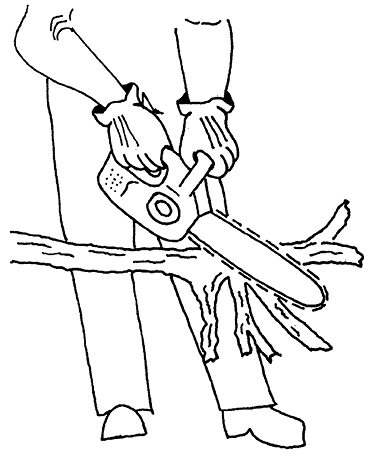 Larger trees may require a series of cuts as shown in Figure 4. When the tree starts to fall, it is time to shut off the chain saw, set it down safely (don’t throw it), and leave on your planned escape route. Do not return to the site until the tree is down and no longer moving. If the tree should roll, let it; one person cannot stop or control a moving tree. Be sure that the fallen tree is stable and will not move as you work. Examine the situation at every limb to be removed. Be certain that the limb will not bind against the saw. 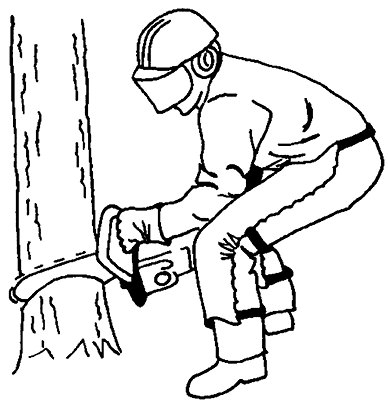 Cut on the opposite side of the tree trunk whenever possible, this keeps the trunk between you and the saw (Figure 5). Never stand on the downhill side when removing limbs. Always keep in mind that the tree trunk may roll as limbs are removed. Watch for limbs that may spring out when they are cut due to the released tension. These limbs can cause injury. Figure 5. Whenever possible, keep the tree limb or similar barrier between yourself and the saw blade. When cutting large limbs and the trunk of the tree into convenient lengths (bucking), be sure the trunk is supported along its entire length and will not roll. Block or wedge the trunk in place, if needed. Cut downward from the top of the trunk (overbuck) about one-third of the diameter and then roll it over to make final cuts. Wedges can be used to keep the cut open if the log cannot be rolled over. They must be driven with care so they will not come into contact with the chain saw. Even though this should prevent pinching, always be alert to the situation (Figure 6). 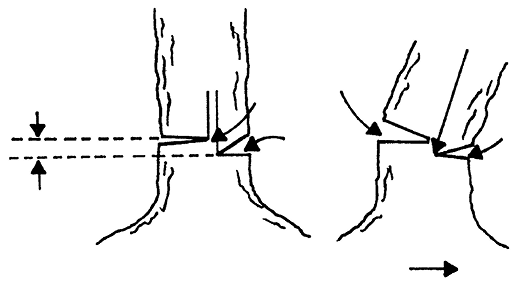 If the limb or tree trunk is supported by both ends as shown in Figure 7 cut downward one-third of the way and then finish by cutting upward from the underside to meet the first cut. Be careful to keep the saw out of the dirt, the teeth will throw debris and be dulled, and wear on the chain will be increased. As limbs become smaller in the cutting process, a saw buck will become handy. 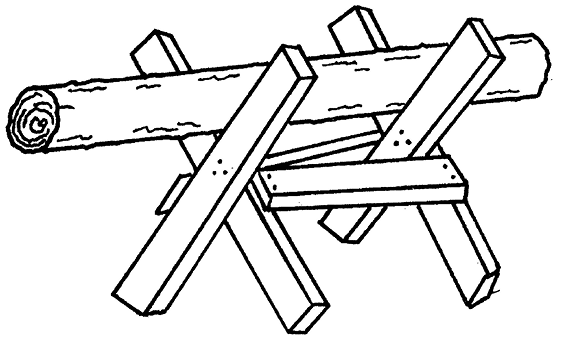 It will hold the small logs or limbs at a more comfortable height and prevent them from rolling as they are cut (Figure 8). Some saw bucks can be made collapsable for convenient transporting. • when the nose of the blade strikes another object. • starting a bore cut improperly. • when the blade nose or tip catches the bottom or side of a saw cut during reinsertion. The best defense against kickback is to keep the tip guard on the chain saw. However this does limit what you can do with the tool. Some kickback control can be maintained by keeping a firm hold on the saw and using a saw which has a chain-brake or kickback guard. Always be watchful for blade-pinching situations and plan accordingly. Cut branches at the base of the blade, don’t saw with the tip of the blade. Use a high chain speed when reinserting the blade in a cut or removing it from a cut. Keep the saw teeth sharp so they will cut; dull teeth are more likely to cause a kickback. 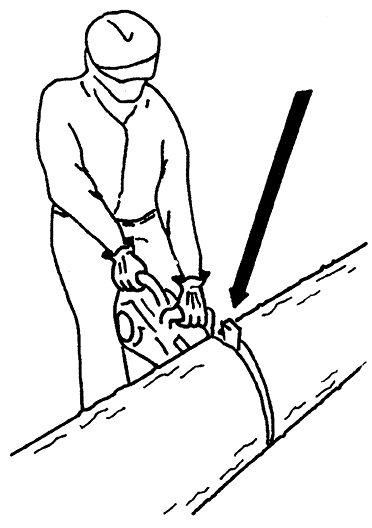 Always cut below shoulder height, otherwise the saw is difficult to control and is too close to your face. • Always avoid making cuts with the saw between your legs, always cut with the saw to the outside of your legs. • Don’t stand on a log and saw between your feet. • Always stand to one side of the limb you are to cut, never straddle it. • Always keep in mind where the chain will go if it breaks, never position yourself or other people in line with the chain. • Keep the chain out of the dirt, debris will fly, the teeth will be dulled and the chain life shortened considerably. The chain saw should be transported in a level position with the gas cap up. Tipping will cause spillage of gasoline, a fire hazard. Do not carry the saw in the passenger area of a vehicle, it is a dangerous thing to have flying around in a vehicle accident. The saw should be transported in a case but if one is not available then keep the bar in a chain guard. Storage of the chain saw requires draining the fuel system. In a safe, ventilated area, pour the fuel from the fuel tank into an appropriate container. After emptying the tank run the engine at idle until it stops, this removes any gasoline from the carburetor and fuel lines. Remove the chain and store it in a container of oil to prevent rust. Refer to the owner’s manual for additional instructions on proper storage preparations. Keep in a dry place and out of the reach of children.